So I’ve already conquered the world of carboots, charity shops and vintage fairs but my thirst for thrift has taken me in a new direction – salvage. Since completely renovating our new house at the beginning of the year we were left with a very blank canvas and slowly we’ve been buying nice little bits for the house and bigger bits in the form of vintage furniture. 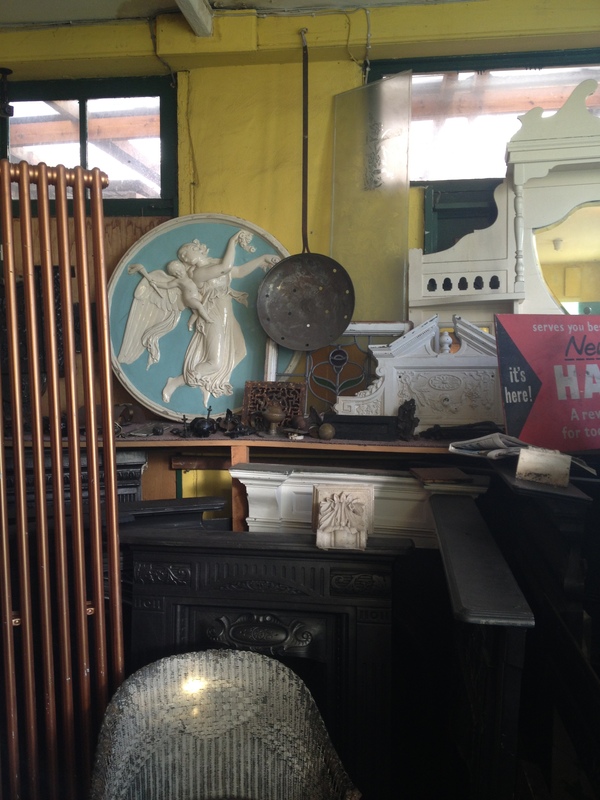 But for those ever special features like door handles, light fittings and exterior items architectural salvage is the way to go. 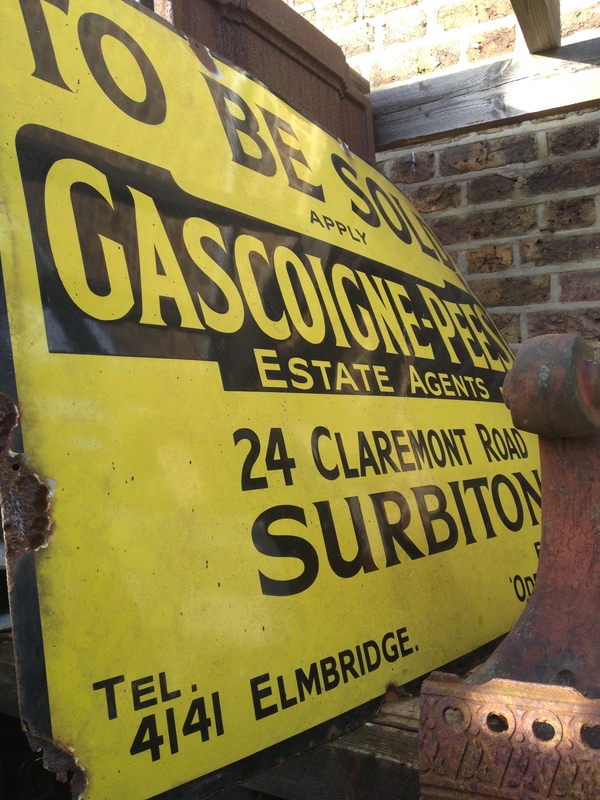 Programmes like Channel Four’s Kirstie’s Homemade Home and History Channel’s Salvage Seekers have brought reclamation to our attention a little more recently and I’ve certainly become aware of a few places nearby. 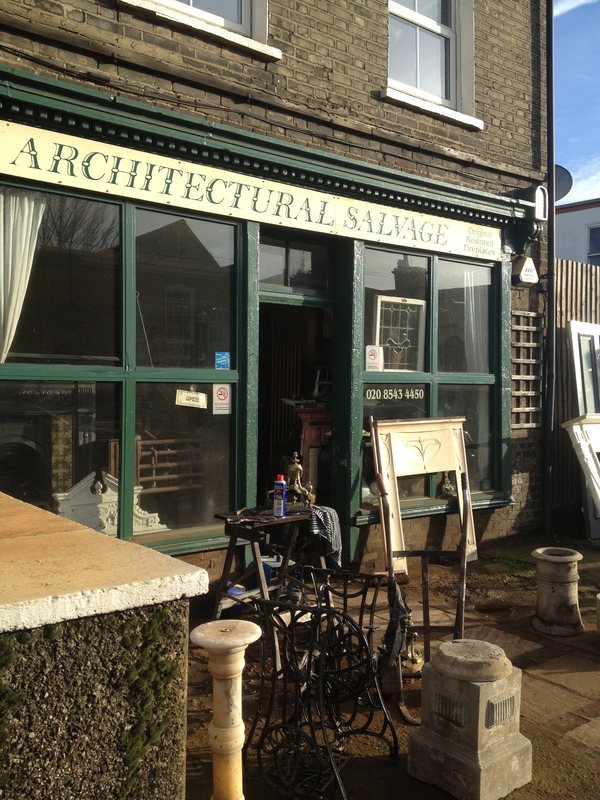 Today we visited for the second time an architectural salvage shop in Wimbledon. The shop is a little out-of-the-way but is one of Wimbledon’s best kept secrets. 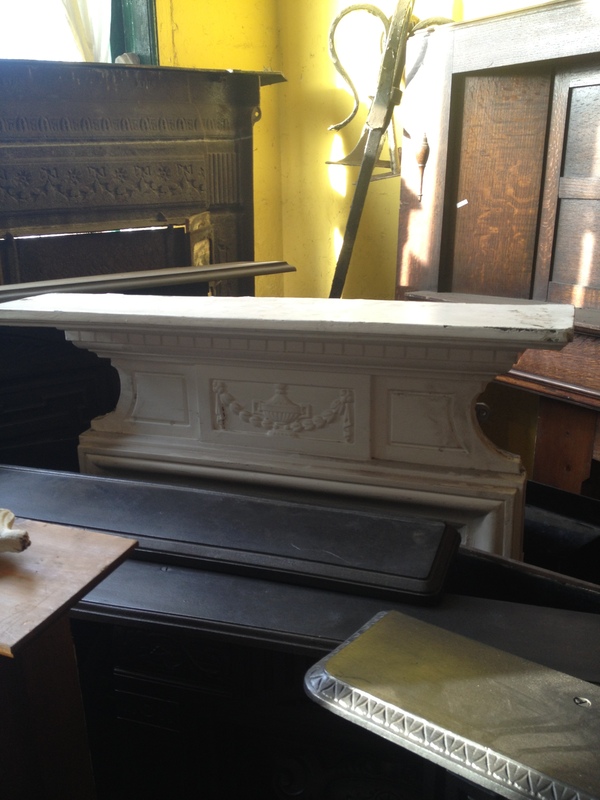 The shop is jam-packed with Victorian fireplaces and doors, but there are also some smaller bits and pieces too. 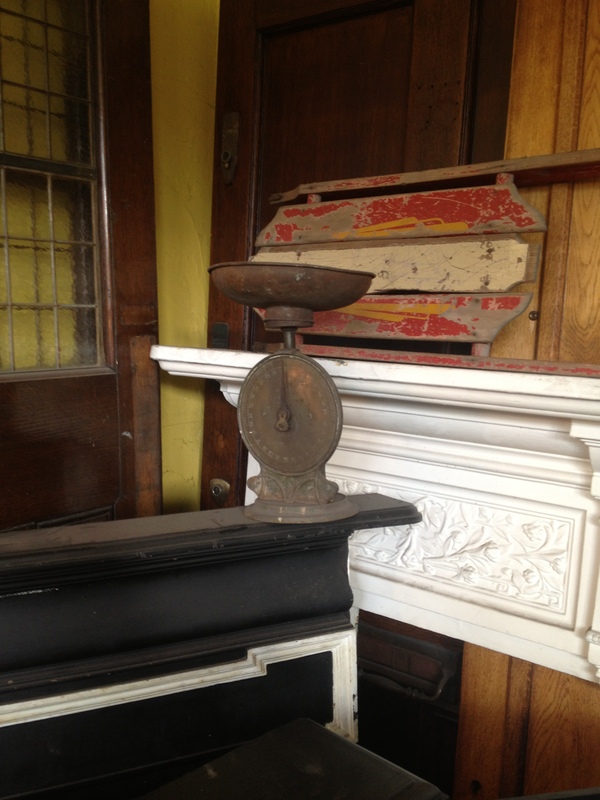 Highlights included enamel sinks, over fireplace mirrors and a fabulous Victorian cash register. We came away with an incredible Victorian etched glass window, which would have been taken from a pub. These are so hard to find now as they were all stripped out of pubs mid twentieth century but have now become very popular again so any pubs that still have them are keeping them. Our plan is to clean it as best we can and have a new door made to incorporate it. The glass was priced at £50 but we managed to get it for £40 as we were buying other things. This is an absolutely amazing price for such a rare item with so much character. We also got a set of antique glass door knobs which we will be using on all the upstairs door of the house. These were prices at £25 per pair. I can’t wait to use our purchases in the house, they are so unique and interesting. It’s also really important to support small local businesses and with the rise of Ebay smaller companies like this one really suffer. Nothing beats going to look and touch things before buying them and you often end up getting things at a better price. I’m going to share the things I bought in a separate post as they’re packed away in protective paper until I’m ready to get them cleaned up. Has anyone else found any amazing vintage and antu=ique items lately. I’d love to hear about them. 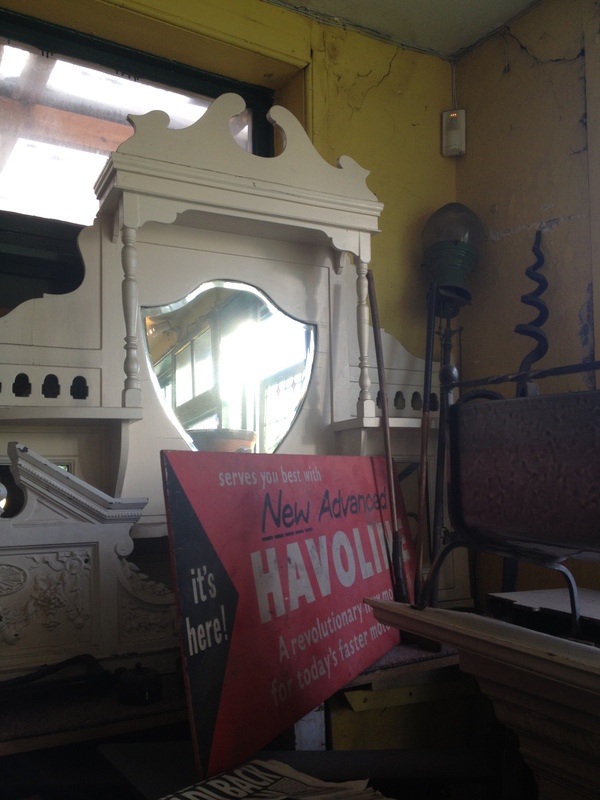 If your stuck for something to do today why not visit your local salvage or reclamation yard? 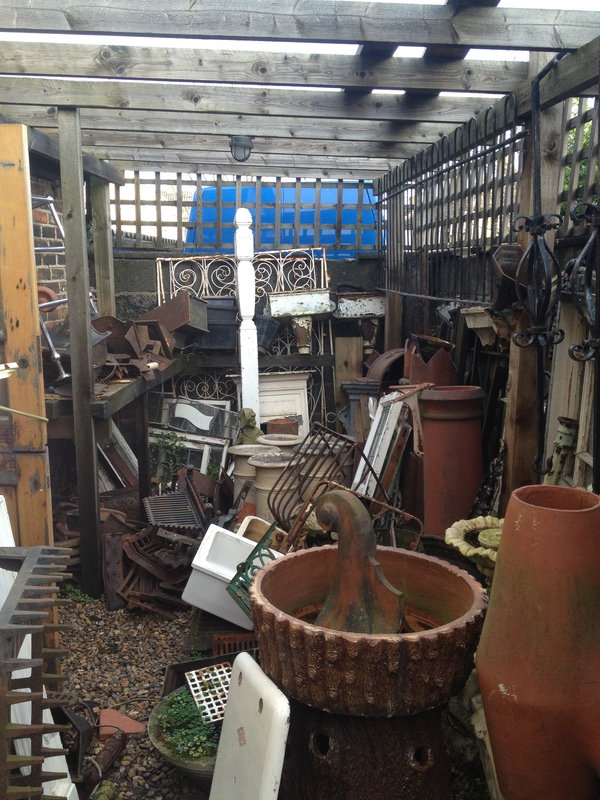 You can find the shop we went to at; 83 Haydons Road, Wimbledon, SW19 1HH. Love decorating with used goodies! This isn’t recent, but my hubby and I picked up a quaint dining table set for $130 at our favorite secondhand furniture store last year. Such a steal, and we get so much everyday use out of it.